In the summer months to come, our first instinct might be to crank up the air conditioner when the heat gets oppressive, but don’t neglect your ceiling fans. These useful home accessories are fairly inexpensive and can help cool your home without causing a huge spike in your utility bills. Many homeowners even consider ceiling fan installation a somewhat easy DIY project. 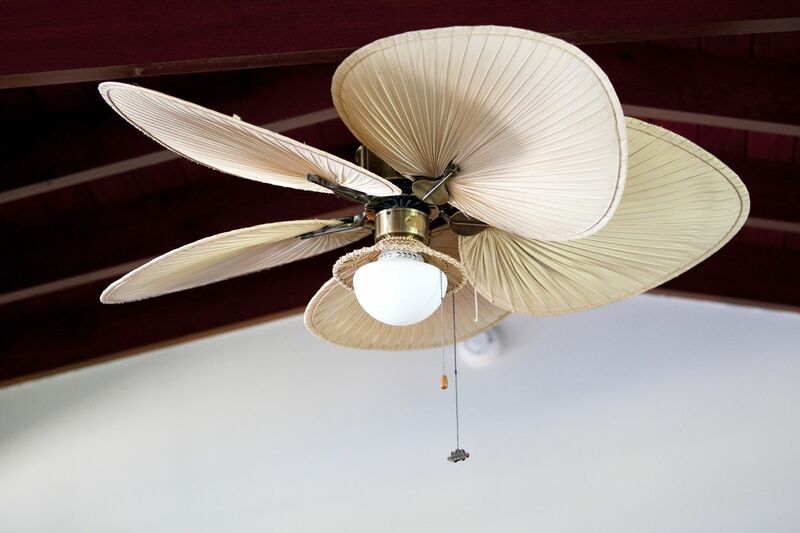 If you don’t already have a fan installed, we can help you choose a ceiling fan that fits your space perfectly. While aesthetics are certainly important, you’ll also want to consider technical specifications, such as height, blade span and ceiling slope. Additionally, if energy savings are a major priority, you have some great ENERGY STAR®-certified options to choose from. But before you make a final fan decision, let’s review the basics of how these appliances actually work. Do Fans Cool A Room? So, do fans cool a room? Yes and no. While a ceiling fan doesn’t make the air colder on its own, it does help more efficiently circulate the cold air your air conditioner produces. In fact, by giving your ceiling fans the task of moving cold air through your home, you can give your air conditioner unit a much-needed break. According to the United States Department of Energy, ceiling fans cool more effectively than any other type of fan. This is because a ceiling fan’s circulation patterns create a draft. By using a ceiling fan, you can bump up your thermostat setting by as much as 4 degrees and still keep your rooms at a comfortable temperature. Even better, ceiling fans do not need to run constantly in order to do their job. Ceiling fans cool the room’s occupants, not the room itself — meaning you can turn off any ceiling fans in rooms that are not currently in use. When running your ceiling fan in the warmer months, make sure the blades are rotating in a counter-clockwise direction. A counter-clockwise rotation drives air downwards, creating an interior “wind chill” effect. In the cooler months, make sure you remember to switch your fan back to a clockwise rotation in order to pull warm air away from the ceiling. Each model of fan handles this functionality differently. Refer to the manufacturer’s instructions on how to switch your blade rotation. If your ceiling fan is wobbling or making strange sounds, it probably needs to be re-balanced. Luckily, if you are comfortable standing on a ladder while using tools, this is a fairly simple DIY fix. First, check that all the blades and the blade holder are screwed tightly into the ceiling fan base. This is a good time to remove any dust or buildup you see per the manufacturer’s instructions. Dirty blades and/or a dirty motor can interfere with your fan’s performance. Once you have cleaned the fan and checked for any loose parts, run the fan again. If it’s still not working properly, the culprit could be a blade that is out of alignment. Check each blade with a ruler and/or spirit level. 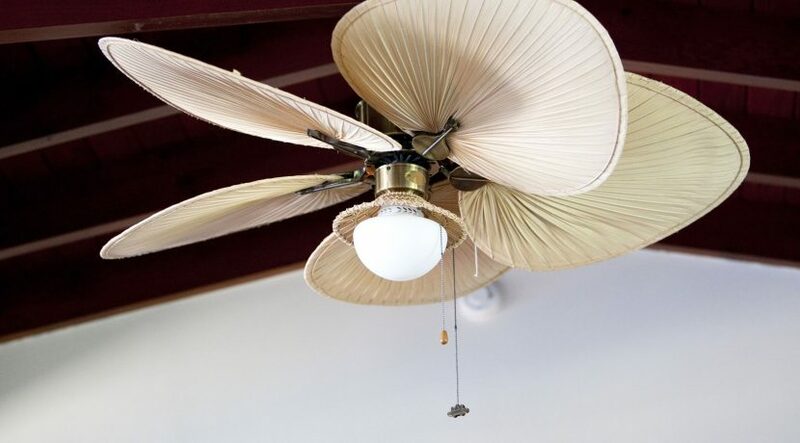 Gently bend any crooked fan blades back into alignment. Of course, if you’ve invested in an affordable American Home Shield warranty, your ceiling fan may be covered and one of our helpful technicians can assist you. Give us a call to learn more today!